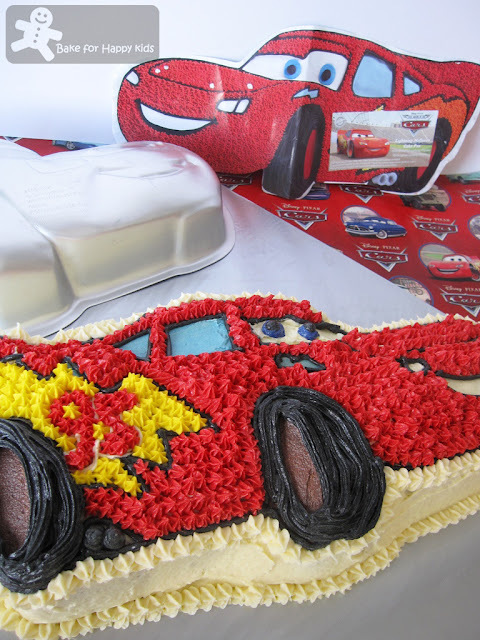 This Lightning McQueen cake is not flawless but is made with lots of love. Happy 2nd Birthday, son! Mum made this cake for you. The lightning McQueen cake pan that I used is from Wilton and it comes with concise baking and decoration instructions. I didn't like the idea of using instant cake mix or frosting mix as mentioned in the instructions. To me, using the instant mix wouldn't make any difference from buying the cake from any cake shops. Here's the recipe that I used to make the Lightning McQueen cake base. 1. Preheat oven to 160°C (fan forced). 3. Beat butter and sugar until light and fluffy. Add eggs, one at a time, beating well after each addition. 4. Fold in sifted flours, soda (baking powder) and cocoa powder (with combined coffee powder and coloring), water and milk alternatively and in 2-3 batches. 5. Sift flour, cocoa powder, coffee powder, baking soda and salt into a separate bowl. 6. Pour mixture into prepared pans. 7. Bake for 45 min or until skewer comes out clean when inserted in center of cake. 8. Turn cake onto wire rack to cool. The amount of ingredients is increased by 1 1/3 time of the above recipe. All areas of the pan has to be filled evenly with this amount of batter and the excess might fall off the pan while baking. After the cake is removed from oven, cool the cake for 10 minutes. While the cake is still in the pan, carefully slice off the raised center portion of the cake. This allows the cake to sit more level and helps prevent cracking. To remove cake from pan, place cooling rack against cake and turn both cake rack and pan over. Lift pan off carefully. Cool cake at least one hour. Brush loose crumbs off cake and transfer cake to serving board. The Wilton instruction uses shortening to make their buttercream which I think that it is a bad idea to feed my son and his little friends with this large amount of saturated fat. I know that butter is as bad but definitely better than shortening. This is the buttercream recipe that I have used. Cream butter and icing sugar with electric mixer. Add milk gradually while beating at medium speed until light and fluffy. Add a small amount of light syrup to thin the buttercream for cake icing. This will make 5 1/4 cup of buttercream with approximately 1 cup of excess. 1. Ice cake sides, background areas, front windshield, mouth, headlights smooth with thinned white. 2. Ice side windows and small lightning bolt smooth in Light Blue. 3. Ice wheel wells smooth in dark Red. 4. Outline car, windows, mouth, headlights, hood, lightning bolts and tires with tip 3 in Black. 5. Outline number with tip 3 in White. Add tip 3 dot rivets on hood. 6. Cover tires with tip 16 lines in Black. 7. Pipe-in eyes with tip 3 in Blue (smooth with finger dipped in cornstarch). Pipe-in pupils with tip 3 in Black (smooth with finger dipped in cornstarch). 8. Cover car with tip 16 stars in Red. 9. Cover lightning bolt with tip 16 stars in Yellow and Orange. 10. Cover number tip 16 stars in Orange. 11. Pipe muffler with tip 3 in Gray. 12. Pipe shell bottom border with tip 21 in White. Happy Baking and I'm very happy baking this cake. What a wonderful mother you are. You did yourself proud with this cake. What a beautiful cake! You are really talented. Your son must be extremely happy to see his beautiful cake. He is indeed a lucky boy! 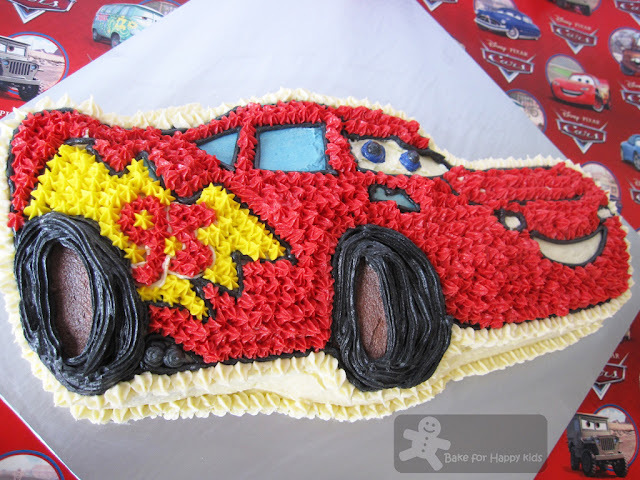 Zoe, what a coincidence tomorrow is Gabriel birthday and he will have lightning McQueen cake too...but I ordered it from baker not confident to make one for him ^_^ Your son's lightning McQueen cake is so beautifully done! wow, beautiful cake zoe! !...my jaw almost dropped off when i saw this..This sure made you a happy woman! !..Happy 2nd Birthday to your son!! WOW, this is indeed so pretty!!! wah this is a really big project! well done Zoe!!! looks really beautiful! That looks fantastic! My son would love that. Happy birthday to your little man! great effort in assembling this cake. I bet it must have taken you a lot of time into doing it. Well done! Happy Birthday to your son! and i should appraise you that you really had made the cake wonderful--a piece of art! You are really a great mom! Omg, wat a marvellous cake, its looks out of the world..
My kids would say so many wow by looking at this, very pretty. Love your blog will visit often. such a beautiful home-made cake! Happy birthday to your son! Lovely cheerful cake, anyone would be happy to see itt...and taste it! The cake looks very rich and chocolaty, yum! hi zoe, the cake looks very attractive, you're such a wonderful and dedicated mum, i must say! This doesnt look easy to me and nice piping! Ooooh, this is so cute! I just made a football cake- I wish I would have had your decorating talent! too cute!! what an artwork made with much love! 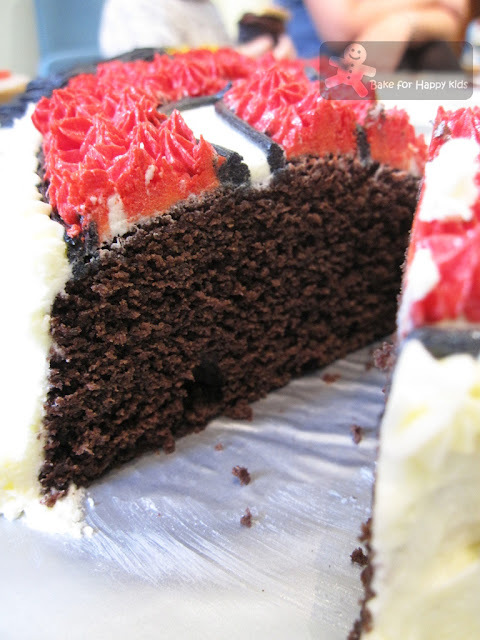 the texture of the cake looks delicious as well! yea thats true about instant mix...might as well as get it outside aye. hope your family have a lovely celebration! My son would go crazy with this cake. He is a big fan of lightning Mc Queen. It looks delicious! That's a gorgeous looking cake! So much effort spent! You made this cake?! What an accomplishment! Everyone must have been so impressed! I made that same cake with the same pan a few years ago. I think yours turned out a little neater than mine. My grandson would LOVE this cake!